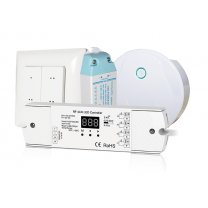 A complete starter pack to install a WiFi controlled lighting control system.It comprises the APPlin..
Controls up to 4 zones of RGBW strip by linking to the HALOled receiver. Within ..
Used to control single colour LED Strip or dimmable lamps by linking to the HaloLED receiv..
APPlink creates a bridge between the HaloLED system components and your Wifi setup. It all..